Fake anti-malarial drugs: Artemisinin and other pills in worldwide survey are substandard or frauds. Fake or weak malaria drugs could cost millions of lives. A worker at Guilin Pharmaceutical, one of only two Chinese companies converting what was formerly considered wild grass herbs into raw material for treating malaria. Malaria medicines that are too weak or downright fake are harming people’s health and could aggravate drug resistance, says epidemiologist Paul Newton, head of antimalarial quality at the WorldWide Antimalarial Resistance Network in Oxford, U.K., and director of the Wellcome Trust-Mahosot Hospital-Oxford Tropical Medicine Research Collaboration in Laos. How big a problem are fake anti-malarials? It’s big. A recent review by the WorldWide Antimalarial Resistance Network found that 30 percent of malaria drugs tested globally failed either chemical or packaging quality tests. Of these, 39 percent were fake. Many of the falsified pills were from southern China. Given the global burden of malaria, if even a small percentage of drugs are fake, it will translate into significant, and avoidable, increases in sickness and death. How vital is the distinction between the fake drugs and substandard ones? In essence, fake anti-malarials are frauds, produced by criminals who intend to deceive health workers and patients. They contain none of the stated active ingredient. Substandard medicines, on the other hand, usually contain insufficient amounts of the active ingredient and result from negligent, but unintentional, errors in factory production. It’s an important difference as the root causes and solutions differ. 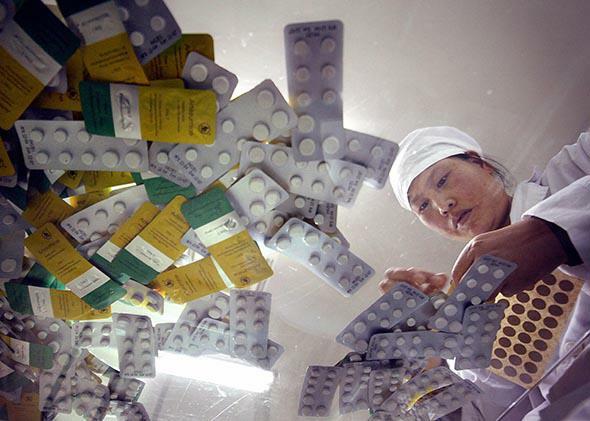 Why are fake and poor-quality drugs a particular challenge in Southeast Asia? Most countries in the area have endemic malaria and a high impact of infectious diseases. So there is high demand for anti-infectives, including for malaria. Criminal gangs exploit this demand for medicines, which are not always readily available in the more remote areas. Resistance to anti-malarials is growing in the region. Are fake or substandard drugs the cause? When taken on their own, fakes, which contain none of the active ingredient, will not risk resistance: There is no drug for any resistant parasites to survive attack from and then multiply. But if the antimalarial contains low amounts of active ingredient, susceptible parasites in the blood are killed but resistant ones multiply—and then are sucked up by mosquitoes to spread. The Greater Mekong area is now the epicenter for resistance to the most potent drug, artemisinin, and there are concerns this could spread to Africa, costing millions of lives. What other factors drive drug resistance? There are many: Patients not taking full courses at the correct doses, availability of anti-malarials over the counter, and patients taking a single drug instead of a combined therapy. The World Health Organization recommends that artemisinin always be given with another antimalarial in the same tablet. The artemisinin kills most parasites in the first three days of treatment, then the partner drug eliminates the rest. How do you get fake drugs off the market? The steps that have been taken are woefully inadequate. The WHO estimated that 30 percent of countries have effectively no drug regulation, and many of these have endemic malaria. Without functioning regulatory authorities, most interventions are doomed. To improve the quality of our medicine supply, we need much more international political will, backed by investment.